In recent years, China’s activities in Africa have expanded dramatically: Africa–China trade increased tenfold between 1999 and 2006. Chinese political and business leaders visit the continent regularly, and the country is pouring investment and aid into Africa. In exchange, China is securing access to the continent’s natural resources, which Beijing considers essential for China’s further development. Some analysts argue that China–Africa relations have opened up a new era for Africa’s development and a new style of cooperation. But the Chinese engagement is questionable in terms of peace and security, which is now the main problem facing Africa and the fundamental obstacle to the continent’s integration. In this chapter, I will be looking particularly at the impact of the new China–Africa ‘alliance’ on peace and security in our continent by considering the case of Darfur. China is now the world’s second largest consumer of oil. More than 25 per cent of its oil imports come from the Gulf of Guinea and Sudan. China’s investment in Africa now stands at $1.5 billion a year. There are at least 700 Chinese enterprises operating in the continent. In terms of debt relief, China recently wrote off $1.3 billion owed by African countries, which has led to a fresh injection of good feeling in Africa towards China. China’s new strategic partnership with Africa effectively took off at the November 2006 Beijing summit. This marked an historic moment in China–Africa relations. At this meeting, 48 African delegations including 44 heads of state lined up in front of the Chinese presidential palace to great the Chinese president. It is rare – even during the African Union summits – to see so many important African heads of state at a single meeting. Something very attractive must have been promised! In fact, it is raising global energy demands that have caused China to turn to Africa as a major supplier of oil. In addition, Africa seems to have become an open market for comparatively ‘cheap’ Chinese manufactured products. Armed violence is one of the greatest threats to Africa’s development. Africa currently gives the impression of a continent riddled with territorial disputes, armed ethnic conflicts, civil wars, violence and the collapse of governments and states. In the last 40 years there have been at least 30 major conflicts in Africa, which have claimed the lives of seven million people and displaced more than 20 million. In a report published in October 2007 IANSA, Oxfam and Safeworld estimated the economic cost of armed conflict to Africa’s development. Findings showed that around $300bn since 1990 has been lost by Algeria, Angola, Burundi, Central African Republic, Chad, Democratic Republic of Congo (DRC), Republic of Congo, Côte d’Ivoire, Djibouti, Eritrea, Ethiopia, Ghana, Guinea, Guinea-Bissau, Liberia, Niger, Nigeria, Rwanda, Senegal, Sierra Leone, South Africa, Sudan and Uganda. Yet 95 per cent of the weapons used during those conflicts come from outside of the continent – many of them from China or marked ‘made in China’. Reports further revealed that most of those weapons are sold to governments in Africa and end up in the hands of whoever wants to use them. Behind the so-called principle of ‘non-interference in other’s domestic issues’, China’s relations with Africa create challenges for governance, peace and security in the continent. Supporting and reinforcing despots and genocidal and undemocratic regimes that systematically terrorize their citizens in order to remain in power is just not useful for a continent that has suffered for many decades and that has been trying to escape from this situation. China is not the cause of the ongoing conflict in Darfur but Chinese oil investment in Sudan undermines international efforts to end the Darfur crisis. China has acted as Sudan’s key international patron and has been crucial to the ruling National Congress Party’s (NCP) foreign relations on the question of international intervention in Darfur. The NCP would not have been able to pursue its strategy in the absence of Chinese support. China has so far played a largely negative role in the crisis – it has repeatedly obstructed meaningful UN Security Council resolutions and shielded the government of Sudan from international pressure. There are also numerous reports implicating China as a key provider of military equipment and establishing arms factories in Sudan and Darfur rebels have recently targeted Chinese oil interests in response. However, if China is encouraged to play a more constructive role on Darfur, then potentially it could be a crucial catalyst for change due to its enormous economic leverage over the government of Sudan. China is Sudan’s largest bilateral trading partner, responsible for buying up to 71 per cent of Sudan’s exports. China continues to support the government of Sudan, but its increased diplomatic engagement and more critical posture toward the regime can contribute to peace. Chinese relationships with some African governments reinforce dictatorship and provide new opportunities for authoritarian regimes that take citizens in a permanent hostage This is undermining all the efforts of the continent to build democratic institutions and states. The same applies to Zimbabwe. President Robert Mugabe has repeatedly said that he prefers to forge strong relation with China because, unlike the West, China does not place any political conditions on its investment aid. Yet Mugabe, in power for the last 28 years, is seen today as the worst dictator of the region. The establishment of the African Union (AU) in 2002 reflected a new moral awareness of the need to provide the continent with a political framework and legal tools to deal with issues of ‘non-indifference’. The provisions in both the Constitutive Act of the AU and the Protocol Relating to the Establishment of the Peace and Security Council (PSC) are in proximity with the notion of ‘non-indifference’ when faced with massive and heinous crimes committed against civilians in Africa. This constituted a major difference between the AU and its predecessor, the Organization of African Unity. The AU founders recognized the right to intervene in the internal affairs of member states in order to protect human rights and constitutional order. This is enshrined in Article 4(h) of the Constitutive Act 2000, which clearly states that the AU has a right to intervene in the affairs of a member state pursuant to a decision of the assembly of heads of state in respect of ‘grave circumstances’, namely war crimes, genocide and crimes against humanity, as well as a serious threat to legitimate order, in order to restore peace and stability in a member state. In order to implement this significant shift, the AU has put in place a strong and effective institutional framework to support and sustain that political will. This realization provided the impetus for the elaboration of an African Peace and Security Architecture (APSA), which recognized the importance of investing in the anticipation and prevention of conflict and of putting in place structures to resolve conflicts effectively once they have broken out. APSA consists of the Peace and Security Council, the Framework for the operationalization of the Continental Early Warning System, the Panel of the Wise, the African Standby Force and the AU Policy on Post-Conflict Reconstruction and Development. In addition, in September 2005, world leaders at the UN General Assembly, made a historic commitment to their collective responsibility to protect civilians from genocide, war crimes, crimes against humanity and ethnic cleansing, including a willingness to take action where the national government – which has primary responsibility – is manifestly failing in this regard. These new developments, coupled with international and civil society pressures have probably impacted upon China’s thinking and behavior in Africa. Due to both civil society and international pressure, Beijing is learning that separating business from politics is easier said than done. Therefore, over the last two years there have been signs that Chinese language and engagement on the situation in Darfur is improving and that China wants to be seen and credited as a positive actor in the crisis. After years of repeatedly obstructing United Nation Security Council Resolutions, China agreed to Resolution 1769 authorizing the deployment of UNAMID (the United Nations–African Union Mission in Darfur) – and spent considerable diplomatic time and effort lobbying Sudan to accept it. The appointment in the summer of 2007 of the first Chinese special envoy, Liu Guijin, is another indication that China at least wants to be seen to be doing something, even though the profile of the special envoy has been very low key since his arrival in Khartoum, where he prefers to do things quietly and behind closed doors. While this may be an alteration of policy more in form than substance, it still presents an opportunity for pressure to be placed on Khartoum via a Chinese interlocutor. At the same time, it allows China to promote its own interests through more vocal diplomacy and participation in multilateral forums on Darfur. At the January 2008 AU summit, the Chinese delegation issued an unprecedented public warning to the government of Sudan that the world is ‘running out of patience on Darfur’. Prior to that the Chinese ambassador to Sudan, Wang Gangly, was reported as saying, in February 2007, ‘Usually China doesn’t send messages, but this time [on the occasion of Chinese President Hu Jintao’s recent visit to Sudan] they did … It was a clear strong message that the proposal from Kofi Annan is a good one and Sudan has to accept it.’ To try and improve public perceptions of its role, China has also increased humanitarian aid to Sudan, including assisting in the construction of 120 schools and hospitals. However, at around $10m this is still relatively small compared to China’s economic interests. Some Chinese companies are building an 85km-long water project in South Darfur and 315 Chinese engineers were deployed to Darfur in October 2007 to take part in UNAMID. Encourage the government of Sudan to cease any support of actors destabilising and exacerbating the crisis in Darfur and Chad. Contribute more financially to the African Union’s Peace and Security Architecture. 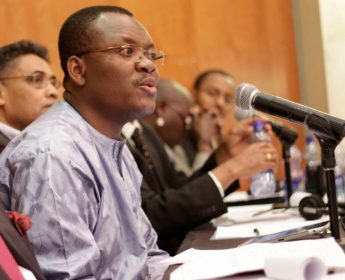 A native of Togo, Desire Assogbavi is currently the Head of Oxfam International’s Liaison office with the African Union. . The opinions expressed in this article are entirely those of the author and do not reflect the view of his organization. 1. China is the largest arms supplier to Sudan, officially selling the country $83 million in weapons, aircraft and spare parts in 2005, according to Amnesty International USA. That is the latest year for which figures are available. China provided Sudan with A-5 Fantan bomber aircraft, helicopter gunships, K-8 military training/attack aircraft and light weapons used in Sudan’s proxy invasion of Chad in 2007. Africa’s missing Billions: International Arms flows and the cost of conflict. Oxfam publication 107, October 2007.